Need help? Here I tell you about a piece of technology or software for writers. Today I write about Wordflex. If you’ve been a reader of mine for more than a few weeks you’ll know I’m a big believer in mindmaps. They are my magic bullet for writing. But I don’t just write with mindmaps, I also enjoy using them for exploring. Perhaps that’s one of the reasons I consult the Visual Thesaurus just about every day. Now, I discover, there’s another tool that’s extremely mindmapper-friendly. 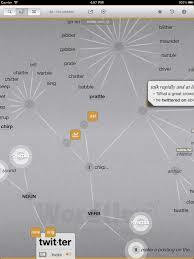 It’s Wordflex — a dictionary app built for the iPad in association with Oxford University Press. Instead of offering static entries, in micrographic print, Wordflex displays word details in tree form, branching out from the main entry into subentries, then nodes. The main entry, which is the word you’ve searched for, includes both a British and U.S. English pronunciation, a brief origin of the word, and the possibility of a related image. Subentries may include classification, syntax, definition, phrases, derivatives, and informal synonyms. To navigate through a definition you simply use your fingers. First, either search for a word by clicking on the magnifying glass icon at the top of the screen and typing out the word. Or, discover new words with shuffle mode. Do this and random words and phrases will “float” towards you. When you see a word that interests you, simply tap on it to select. When I did this I was reminded of swimming. Now there’s a lovely metaphor: swimming in language! Disclosure: The developers sent me a free code so I could try out Wordflex. And they’ve given me three codes to give to my readers. Anyone who posts a comment on my blog this week — by no later than Friday, June 15, 2012 is eligible for a draw to win one of the codes. (Note: You’ll need your own iPad to be able to use the dictionary.) If you’re interested, please describe why in your post. I’ll be announcing the winners on Tuesday, June 19.